MOSCOW, Russia -- Russia is the target of a global plot orchestrated by the United States and involving fighters from the self-styled Islamic State (IS) and nationalist Ukrainian troops - that is the latest conspiracy theory broadcast on Russian state TV. 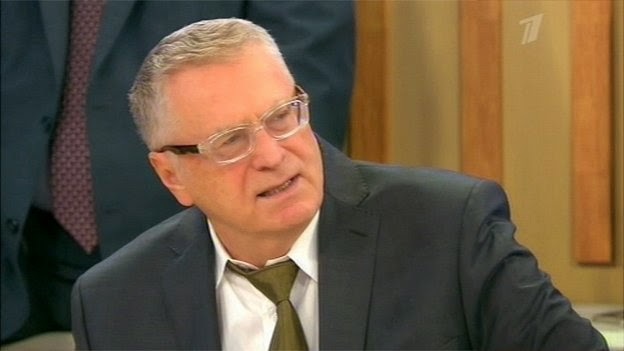 Russian nationalist Vladimir Zhirinovsky: US is training "a new generation of killers" in the Middle East and Ukraine. "America is everywhere, the West is everywhere, NATO is everywhere. Everything is organised against Russia," the veteran Russian nationalist MP Vladimir Zhirinovsky railed during a talk show on Channel One, Russia's most popular TV station. There was a "certain link", he hinted, between Ukrainian troops "raiding our western regions" and IS, which he said was being armed by the US. Joining the studio discussion by video link, pro-Moscow Chechen leader Ramzan Kadyrov alleged that IS leader Abu Bakr al-Baghdadi was a "CIA employee". He suggested that he had been recruited while in prison. Kadyrov and Zhirinovsky were speaking on Time Will Tell, a new daytime political talk show on Channel One. Its appearance at a time of day normally reserved for soaps, cookery shows or celebrity chat is just one example of how highly emotive coverage of the Ukraine crisis is increasingly dominating Russian TV schedules. Time Will Tell host Pyotr Tolstoy took up the IS-Ukraine conspiracy theme by suggesting a link between IS leader Baghdadi and Ukrainian ultra-nationalist leader Dmytro Yarosh - they were both born in 1971, both went to university, both have written a book, he said. They were both members of a "new generation of gunmen" being trained by the US, he claimed. Moreover, Zhirinovsky added, Mr Yarosh is "more dangerous because he wants to take Moscow, while the Islamic militants only want to take the Caucasus". These frenzied exchanges were triggered by reports about unmarked graves in an area of east Ukraine said until recently to have been under the control of pro-Kiev forces. Russian state TV has referred to them as a "mass grave", but a local official appearing on Time Will Tell said four bodies had been discovered. The bodies in the graves are said to show signs of torture. Tolstoy said the discovery was part of a "gallery of horrors stretching from Donetsk to the Middle East". Earlier in the Ukraine crisis, Channel One had highlighted claims by a woman refugee that Ukrainian troops had crucified a three-year-old boy on an advertising hoarding. It showed her testimony in its prime-time bulletins three days running. But no evidence was ever produced to substantiate the claims. In an article in US magazine The Atlantic, London-based TV producer Peter Pomerantsev said the "crucifixion" story was an example of how the "borders between fact and fiction [on Russian news] have become utterly blurred". This was particularly true, he said, following the downing of Malaysia Airlines Flight MH17 over east Ukraine in July, when the "Kremlin and its affiliated media spat out outlandish theories" about the disaster - from a plot to kill President Vladimir Putin to claims the airliner had been packed with corpses. Conspiracy theories like these are now "all over Russian TV", Mr Pomerantsev said. A UK-based researcher, Ilya Yablokov, wrote in a recent article for the Moscow Times that conspiracy theory has been a key element in Russian political discourse stretching back to Soviet times. The latest wave of conspiracy mania, though, began with the mass anti-Kremlin protests that rocked Moscow in 2011-2012. It was then that Russian state TV started to systematically demonise the opposition as American agents. Today opponents of Moscow's intervention in Ukraine are routinely dubbed "traitors" or "fifth columnists". Nationalist commentator Alexander Dugin has even coined the term "sixth column" - to denote members of the establishment who profess support for Putin but also espouse the values of Western liberalism. Conspiracy talk now appears to be rife in Russian society from top to bottom. Putin has described the internet as a CIA "special project", while a recent poll by the state-funded All-Russian Centre for the Study of Public Opinion (VTsIOM) found that 45% of people believed in the existence of some sort of organisation which "exerts influence on all global processes and the actions of many states". According to Yablokov, the function of conspiracy theories is to mobilise society through "fear of foreign or internal deception and subversion". He also suggests that if the current stand-off with the West continues, the Kremlin will turn more and more to conspiracy theory as a "major tool" with which to manage its own people. Quote: «Мы не заинтересованы в том, чтобы нынешний период бесконечно затягивался, - отметил министр. - У нас нет никакого желания продолжать войну санкций, обмен ударами. Мы не будем делать это только ради того, чтобы кому-то «насолить», как это происходит в случае с нашими партнерами, когда они принимают в отношении нас принудительные меры».«Диалог идет, есть результаты выполнения минских документов, - отметил министр. - Устанавливается, хотя, естественно, не без проблем, прекращение огня; внедряются механизмы контроля над ним; начинаются переговоры по линии Россия-Евросоюз-Украина; возобновляются газовые переговоры». «Если бы все проявляли аналогичную добрую волю, я думаю, мы давно бы вышли из этого ненормального периода», - подчеркнул Лавров." All of these statements are empty word, that mean nothing to Ukrainians. Russia should sell gas to Ukraine at World price without special discounts for a pragmatic reason so, in couple of months Russia could not jack up the price again. Russia stop discrimination against Ukrainian products. European Union and USA are doing right thing with its sanctions they being imposed as a response to Russian aggression in Ukraine and destabilization of sovereign Country. Russia must be punished every day for a long time until it learns how to respect others. Russia must officially make changes to the way its address Ukraine in its mass media. It is not на Украине а в Украине, Ukraine is not a окраина of Russia it is independent country, and if that is excepted by Russia then by the Russian grammar all Russian mass media must speak accordingly (in Ukraine). That is where all troubles begins.